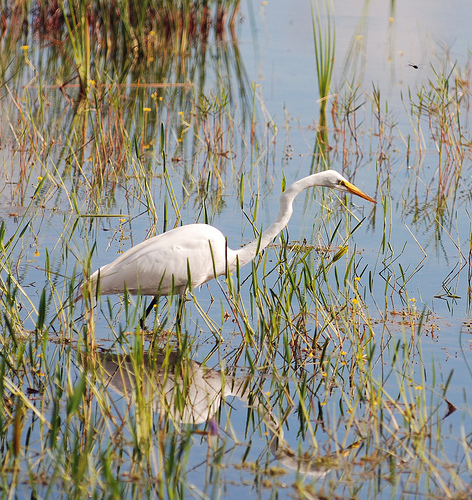 The Great Egret was a rare species in western Europe a few decades ago. We see it more often now. It is said that the global warming has led to a northern expansion. It's an all-white, graceful bird. Like the Grey Heron it folds back its neck while flying. 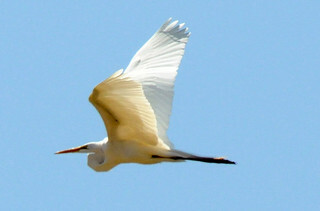 The Great Egret is completely white, the Stork has black patches on its wings. At long distance the Great Egret and Mute Swan look like each other, but the Egret has longer legs and a longer beak. The Great Egret has a dagger-shaped beak and folds back its neck when flying. The beak of the Spoonbill is completely different.